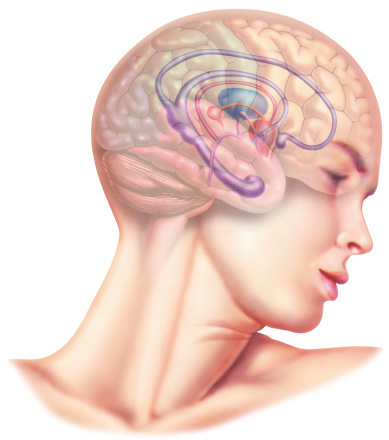 Our understanding of the effectiveness of hypnosis as a pain inhibitor has been increased by modern methods in neuroimaging of the brain; showing that relief from pain during hypnosis is due to an alteration in the blood flow of the brain. ..Generally pain is a signal from the body to the mind that something is going on that we need to pay attention too, and often, that there is a problem that needs to be put right. Whilst the former is true, the later is not necessarily so in childbirth, as the body is doing exactly what it should be doing – contracting the muscles of the uterus to help the baby expel itself out into the world. This is natural, this is labour, and labour is work and sometimes it is hard work, but there is no need to define it in any negative ways. This natural process can be assisted by hypnosis promoting a calming focussed relaxation throughout every stage, altering which messages are sent and received by the brain. The deep relaxation of hypnosis increases the production of your bodies own feel good chemicals, such as, Serotonin, which is involved in the bodies natural ability for controlling pain. Learning how to relax really deeply is extremely good for us in life in general, as well as being particularly beneficial for us during labour and pregnancy in a variety of ways. For example from the outset hypnotherapy can help a mother feel more relaxed, which can also be beneficial to her baby, as research shows that from 17 weeks, the amount of stress hormone in the amniotic fluid surrounding the foetus is positively related to the amount in the mother’s blood. Suggestions absorbed during hypnotic relaxation, such as, being able to stay relaxed and in control no matter what is going on, mean the mother can remain calm, stay in the hypnotic relaxed state and work with the hospital staff in a manner that helps everyone.